The protected region of the Axios-Loudias-Aliakmon Delta holds a multiple status of protection. On an international level, the great importance of the region including the estuaries of rivers Axios, Loudias and Aliakmon was acknowledged in 1975, when it was chosen as one of the ten Hellenic regions to be integrated in the Conventions for Wetlands of International Importance and more specifically as Habitats of Aquatic Birds, known as the Ramsar Convention. On a European level, the ‘AXIOS-LOUDIAS-ALIAKMON-ALYKES KITROUS DELTA’ region was integrated in 1996 in the European Network of Protected Areas Natura 2000 as a Special Protection Zone for the avifauna and the Hellenic administration proposed as Regions of Community Importance the following: ‘DELTA OF AXIOS-LOUDIAS-ALIAKMON-BROADER REGION-AXIOUPOLI’ and ‘ALYKES KITROUS – BROADER REGION’. In 2006 both these zones were published in the European Communities gazette as Regions of Community Importance and under the Biodiversity Law (L. 3937/2011) they were renamed into Special Conservation Zones. On a national level, the first Joint Ministerial Decree of the Hellenic state was published in 1998, on the protection and preservation of the region in the Delta of the rivers Axios, Loudias, Aliakmon and at Alykes Kitrous, while the National Park was established in 2009. Since the 1980’s, the four Wildlife Refuges protected significantly certain parts of these regions. Flamingos owe the striking pink color of their wings to their diet? Their diet basically consists of microscopic red crustaceans which live at the bottom of the lagoons and the salt pans. Flamingos can be seen in the Axios Delta National Park year round, but the largest populations –more than 1.700 birds- can be observed during winter in the Alyki Kitrous Lagoon. 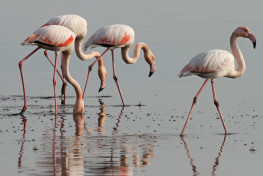 Flamingos are observed in Greek wetlands only the last 20 years. They don’t breed here; they travel for this reason to France, Spain, Italy and other countries.